I had meant to post this recipe a couple of weeks ago but I seemed to have caught up in other things lately and just completely forgot about it until I was making shrimp for dinner tonight and remembered I had a recipe for the shrimp, chicken and andouille gumbo I had made back on Fat Tuesday. Sean had requested some gumbo for that night so I had picked my way through a few different recipes until I came across this one from Bon Appetit. 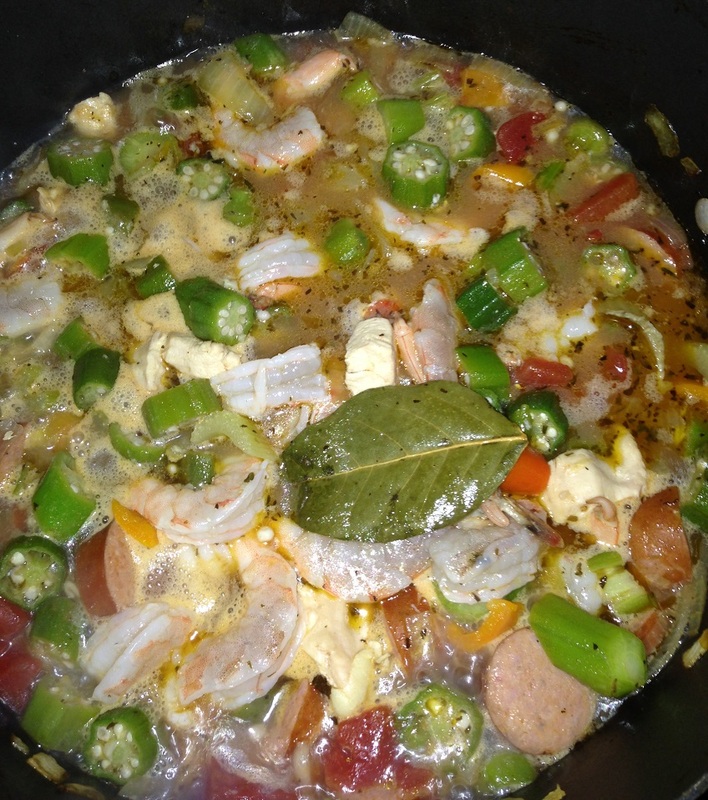 One thing to not about this particular recipe is that it makes a lot of gumbo. The servings for the original recipe are for 16 people. I cut the recipe in half when I made it and it still made a lot with many leftovers, so unless you are planning to feed a lot of people with this one, you might want to try to adjust it to fit your particular meal needs. Either way, it’s a great recipe to use. Heat oil in a heavy 13-quart pot over medium-high heat until it is very hot and almost smoking. Add the flour and stir constantly until the mixture is a dark reddish-brown, about 5 minutes. Add the chopped onions, chopped bell peppers, and chopped celery and cook until the onions are soft and brown, stirring frequently, about 20 minutes. Add the garlic and cayenne and stir for 2 minutes. Add the wine, thyme, and bay leaves; bring the mixture to a boil, stirring occasionally. Add the tomatoes with juice, clam juice, chicken broth, andouille sausage, and the chicken thighs; simmer until the chicken is cooked through, about 15 minutes. Add the okra and simmer until it is tender, about 10 minutes. Add the shrimp to the pot and cook the shrimp until it is just opaque in the center, stirring often, about 5 minutes. Season the gumbo to taste with the salt and pepper. Garnish the gumbo with minced parsley and serve with steamed rice alongside. As you can see this recipe is not hard to make, but it does require an awful lot of prep work to make this easy on yourself. Do all of your chopping and dicing ahead of time and lay everything out for yourself to make it a lot easier and it will all come together quite easily. The flavors are great and I love the spiciness of the andouille with the shrimp and chicken and all of the great vegetables. Making the roux takes some time and attention but it is definitely worth it. 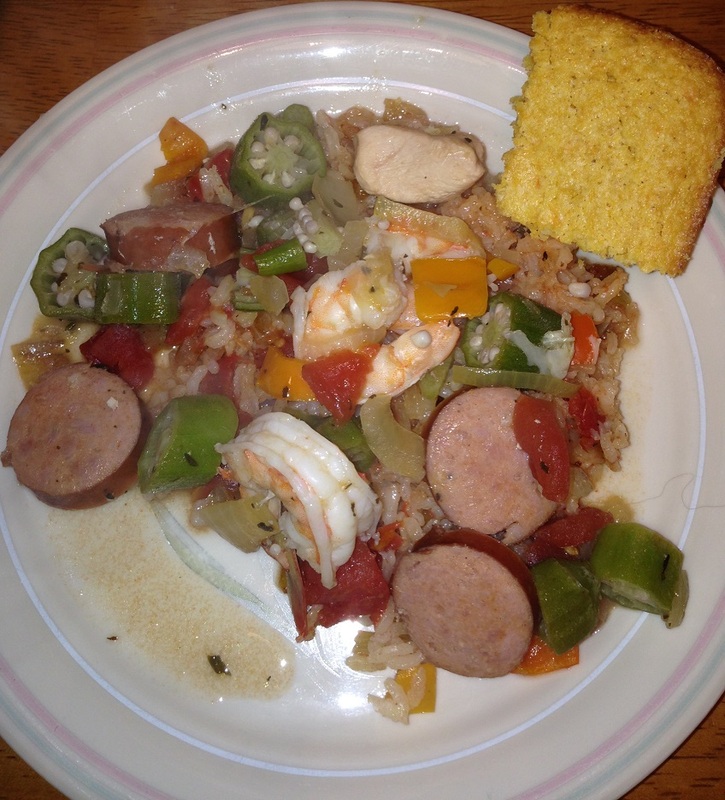 There are lots of gumbo recipes out there that you can try; some omit the shrimp, some include other seafood. it’s really up to you as far as what you like best but you will get a great result and this recipe is perfect to make for a party or a buffet for a lot of people. That’s all I have for today. Check back tomorrow for another recipe to try. Until then, enjoy the rest of your day and enjoy your meal!